Let’s Build A Simple Interpreter. Part 13: Semantic Analysis. Before doing a deep dive into the topic of scopes, I’d like to make a “quick” detour and talk in more detail about symbols, symbol tables, and semantic analysis. In the spirit of “Anything worth doing is worth overdoing”, I hope you’ll find the material useful for building a more solid foundation before tackling nested scopes. 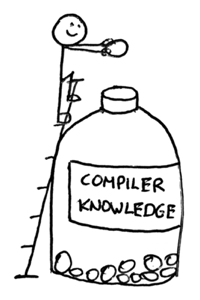 Today we will continue to increase our knowledge of how to write interpreters and compilers. You will see that some of the material covered in this article has parts that are much more extended versions of what you saw in Part 11, where we discussed symbols and symbol tables. While our Pascal program can be grammatically correct and the parser can successfully build an abstract syntax tree, the program still can contain some pretty serious errors. To catch those errors we need to use the abstract syntax tree and the information from the symbol table. Why can’t we check for those errors during parsing, that is, during syntax analysis? Why do we have to build an AST and something called the symbol table to do that? In a nutshell, for convenience and the separation of concerns. By moving those extra checks into a separate phase, we can focus on one task at a time without making our parser and interpreter do more work than they are supposed to do. The parser will handle it all right because, grammatically, the statement is correct (according to our previously defined grammar rules for assignment statements and expressions). But that’s not the end of the story yet, because Pascal has a requirement that variables must be declared with their corresponding types before they are used. How does the parser know whether x and y have been declared yet? Well, it doesn’t and that’s why we need a separate semantic analysis phase to answer the question (among many others) of whether the variables have been declared prior to their use. What is semantic analysis? Basically, it’s just a process to help us determine whether a program makes sense, and that it has meaning, according to a language definition. What does it even mean for a program to make sense? It depends in large part on a language definition and language requirements. It is much easier to enforce the above requirements when we have enough context about the program, namely, an intermediate representation in the form of an AST that we can walk and the symbol table with information about different program entities like variables, procedures, and functions. 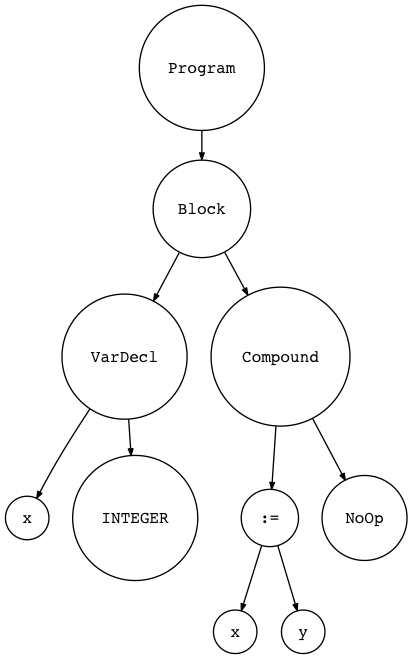 From the picture above you can see that our lexer will get source code as an input, transform that into tokens that the parser will consume and use to verify that the program is grammatically correct, and then it will generate an abstract syntax tree that our new semantic analysis phase will use to enforce different Pascal language requirements. 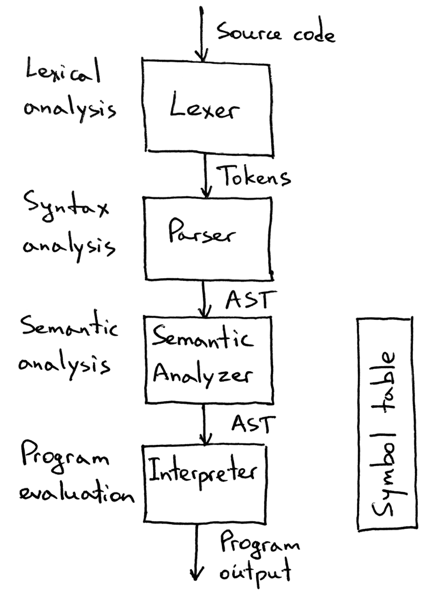 During the semantic analysis phase, the semantic analyzer will also build and use the symbol table. After the semantic analysis, our interpreter will take the AST, evaluate the program by walking the AST, and produce the program output. Let’s get into the details of the semantic analysis phase. In the following section, we’re going to discuss how to implement some of the semantic checks and how to build the symbol table: in other words, we are going to discuss how to perform a semantic analysis of our Pascal programs. Keep in mind that even though semantic analysis sounds fancy and deep, it’s just another step after parsing our program and creating an AST to check the source program for some additional errors that the parser couldn’t catch due to a lack of additional information (context). *ASIDE: Static semantic checks are the checks that we can make before interpreting (evaluating) the program, that is, before calling the interpret method on an instance of the Interpreter class. All the Pascal requirements mentioned before can be enforced with static semantic checks by walking an AST and using information from the symbol table. Dynamic semantic checks, on the other hand, would require checks to be performed during the interpretation (evaluation) of the program. For example, a check that there is no division by zero, and that an array index is not out of bounds would be a dynamic semantic check. Our focus today is on static semantic checks. So, it is a grammatically (syntactically) correct program, but the program doesn’t make sense because we don’t even know what type the variable y has (that’s why we need declarations) and if it will make sense to assign y to x. What if y is a string, does it make sense to assign a string to an integer? It does not, at least not in Pascal. So the program above has a semantic error because the variable y is not declared and we don’t know its type. In order for us to be able to catch errors like that, we need to learn how to check that variables are declared before they are used. So let’s learn how to do it. The program is grammatically correct, all the variables are declared, and we can see that adding two integers and assigning the result to an integer makes perfect sense. That’s great, but how do we programmatically check that the variables (variable references) x and y in the assignment statement x := x +y; have been declared? When you see a variable reference, such as in the assignment statement x := x + y, search the stash by the variable’s name to see if the stash has any information about the variable. If it does, the variable has been declared. If it doesn’t, the variable hasn’t been declared yet, which is a semantic error. A. What information about variables do we need to collect? B. Where and how should we store the collected information? C. How do we implement the “go over all variable declarations” step? Figure out answers to the questions A, B, and C above. Use the answers to A, B, and C to implement the steps in the algorithm for our first static semantic check: a check that variables are declared before they are used. Symbols will hold that information (name, category, and type) about our variables. What’s a symbol? 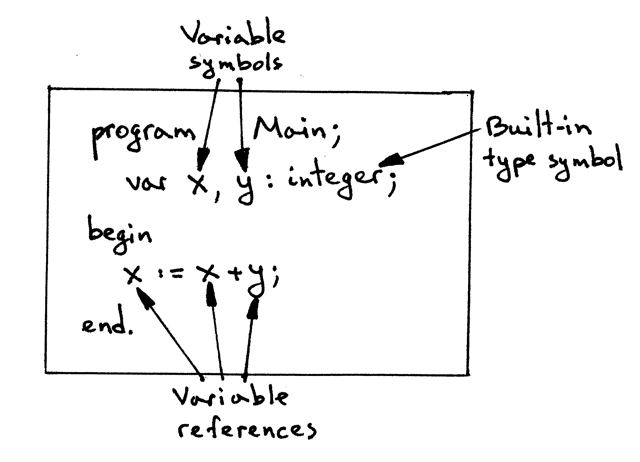 A symbol is an identifier of some program entity like a variable, subroutine, or built-in type. In the following sample program we have two variable declarations that we will use to create two variable symbols: x, and y. As you can see, the class takes the name parameter and an optional type parameter (not all symbols have type information associated with them, as we’ll see shortly). However, it’s more explicit to create a hierarchy of classes where the name of the class indicates its category. The class BuiltinTypeSymbol inherits from the Symbol class, and its constructor requires only the name of the type, like integer or real. The ‘builtin type’ category is encoded in the class name, as we discussed earlier, and the type parameter from the base class is automatically set to None when we create a new instance of the BuiltinTypeSymbol class. The double underscore or dunder (as in “Double UNDERscore”) methods __str__ and __repr__ are special Python methods. We’ve defined them to have a nice formatted message when we print a symbol object to standard output. By the way, built-in types are the reason why the type parameter in the Scope class constructor is an optional parameter. That’s all there is to built-in type symbols for now. Now back to our variable symbols. In this class, we made both the name and the type parameters required and the class name VarSymbol clearly indicates that an instance of the class will identify a variable symbol (the category is variable). The type parameter is an instance of the BuiltinTypeSymbol class. Now that we have all the symbols representing all our variable declarations, where should we store those symbols so that we can search for them later when we encounter variable references (names)? The answer is, as you probably already know, in the symbol table. Name, category, and type. And we use symbols to hold that information. We store collected symbols in the symbol table by using its insert method. This is a really easy one. Because we already have an AST built by our parser, we just need to create a new AST visitor class that will be responsible for walking over the tree and doing different actions when visiting VarDecl AST nodes! We will create a new AST visitor that will do some actions on visiting VarDecl AST nodes. Now, we have all the pieces to implement the first three steps of our algorithm for our first static semantic check, the check that verifies that variables are declared before they are used. When you see a variable reference such as in the assignment statement x := x + y, search the stash by the variable’s name to see if the stash has any information about the variable. If it does, the variable has been declared. If it doesn’t, the variable hasn’t been declared yet, which is a semantic error. # and insert the type symbol in the symbol table. # We have all the information we need to create a variable symbol. # Create the symbol and insert it into the symbol table. You might have noticed that there are two lines that say Insert: INTEGER. We will fix this situation in the following section where we’ll discuss the implementation of the final step (Step 4) of the semantic check algorithm. 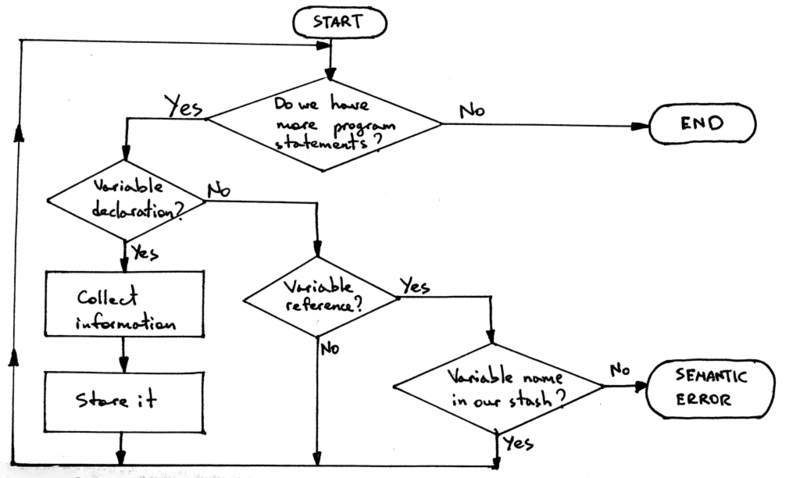 Okay, let’s implement Step 4 of our algorithm. 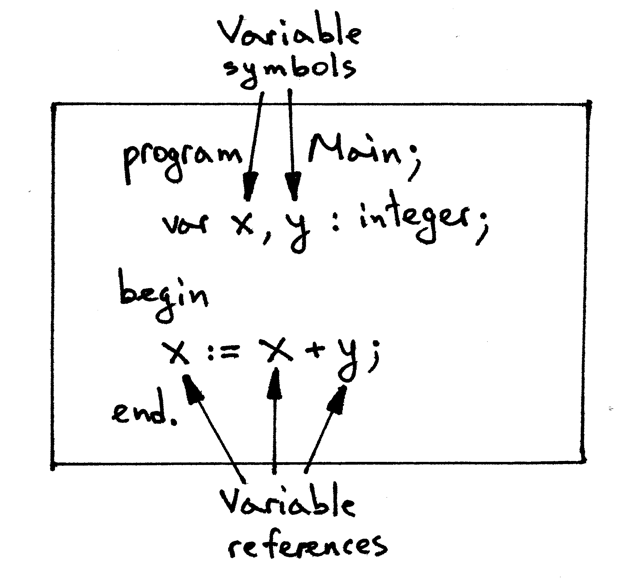 Here is an updated version of Step 4 to reflect the introduction of symbols and the symbol table: When you see a variable reference (name) such as in the assignment statement x := x + y, search the symbol table by the variable’s name to see if the table has a variable symbol associated with the name. If it does, the variable has been declared. If it doesn’t, the variable hasn’t been declared yet, which is a semantic error. We need to add a method to our symbol table that will be able to look up a symbol by name. We need to update our semantic analyzer to look up a name in the symbol table every time it encounters a variable reference. The method takes a symbol name as a parameter and returns a symbol if it finds it or None if it doesn’t. As simple as that. While we’re at it, let’s also update our SymbolTable class to initialize built-in types. We’ll do that by adding a method _init_builtins and calling it in the SymbolTable‘s constructor. 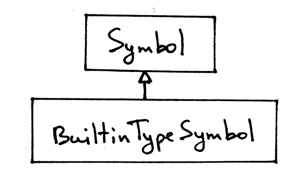 The _init_builtins method will insert a type symbol for integer and a type symbol for real into the symbol table. Now that we have built-in type symbols and the lookup method to search our symbol table when we encounter variable names (and other names like type names), let’s update the SemanticAnalyzer‘s visit_VarDecl method and replace the two lines where we were manually creating the INTEGER built-in type symbol and manually inserting it into the symbol table with code to look up the INTEGER type symbol. The change will also fix the issue with that double output of the Insert: INTEGER line we’ve seen before. You can also see in the output above that our semantic analyzer looks up the INTEGER built-in type twice: first for the declaration of the variable x, and the second time for the declaration of the variable y. You can find the full source code with the changes we’ve just discussed in the file symtab04.py. Download the file, run it on the command line, and inspect the output produced for our sample program SymTab4 with an assignment statement. Spend some time analyzing the output and making sure you understand how and why the output is generated in that order. At this point, we have implemented all of the steps of our algorithm for a static semantic check that verifies that all variables in the program are declared before they are used! 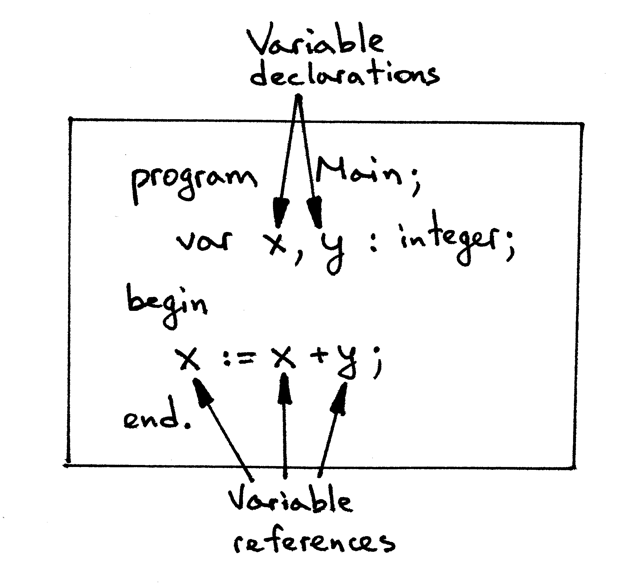 So far we’ve looked at the programs that had their variables declared, but what if our program has a variable reference that doesn’t resolve to any declaration; that is, it’s not declared? That’s a semantic error and we need to extend our semantic analyzer to signal that error. You can see the error message Error: Symbol(identifier) not found ‘y’ and the contents of the symbol table. Congratulations on finishing the current version of our semantic analyzer that can statically check if variables in a program are declared before they are used, and if they are not, throws an exception indicating a semantic error! Let’s pause for a second and celebrate this important milestone. Okay, the second is over and we need to move on to another static semantic check. For fun and profit let’s extend our semantic analyzer to check for duplicate identifiers in declarations. 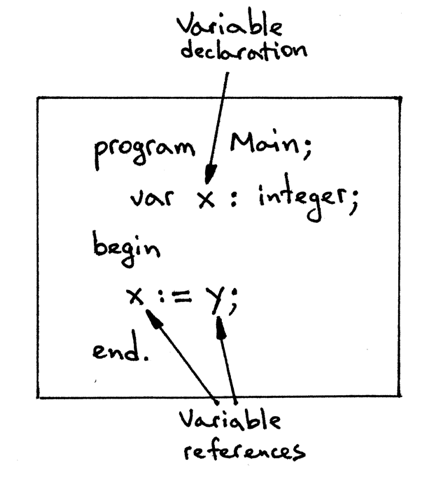 Variable y has been declared twice: the first time as integer and the second time as real. Study the output and the contents of the symbol table. Make sure you understand what’s going on. We’re done with semantic checks for today and we’re finally ready to tackle the topic of scopes, how they relate to symbol tables, and the topic of semantic checks in the presence of nested scopes. Those will be central topics of the next article. Stay tuned and see you soon!